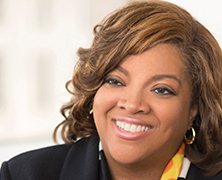 As vice president of communications and corporate affairs at Northwestern Mutual, Kimberley Crews Goode has a busy career connecting and empowering others while executing the communications strategy at the $27.9 billion financial services firm. With 25 years of experience in corporate communications across several global companies, she’s known for removing barriers to make organizations more diverse and inclusive. Goode has been with Northwestern since 2008, where she has been instrumental in shaping brand strategies and driving diversity and inclusion for a cultural transformation. Her colleagues say she is an incredible force for progress and change at Northwestern Mutual as well as in the Milwaukee community. She champions how diversity is translated in the company’s corporate communications and is a mentor and sponsor for many women. She said being a woman in her profession has been rewarding. “My opinion is sought and valued, and my perspective and approach has helped colleagues and organizations reach better business outcomes,” she said. Before joining Northwestern, she held communication positions at Galileo International, American Express Co., Prudential Financial, Kellogg Co., and Visteon Corp. Over the years, she learned that a leader who wants to attract and retain good talent should not only be smart and capable, but must also treat people with respect. Throughout her career, Goode has been honored with numerous accolades for her work and her activism. The most recent was being named by The Network Journal as one of the 25 Influential Black Women in Business. She is a member of the Executive Leadership Council, the national leadership organization of senior African-American corporate executives in Fortune 500 companies. She’s also a member of the Arthur W. Page Society, the Milwaukee Urban League, Big Brothers Big Sisters of Metro Milwaukee, and serves on the National Executive Board of Jack and Jill of America, Inc.
Goode holds a degree from Northwestern University’s Medill School of Journalism and is a member of the Northwestern Mutual Foundation Board, the largest corporate foundation in the state of Wisconsin.